With hybrid and fully electric cars more and more in the news, maybe you’ve been thinking about giving the gas station a pass. If that’s the case, read on—here’s a handy guide from Budds’ with everything you need to know. “Electric” vehicles, such as the Chevy Bolt EV, run on electricity only—as you might imagine. The length of time a vehicle may run without being recharged depends on the vehicle specs, including the weight and number of batteries. A hybrid, as its name applies, runs on a combination of gas and electricity. Plug it in when you need a recharge and you’re good to go. The Chevy Volt is a good example here. Hybrids typically use a technology called regenerative braking—meaning that the vehicle uses the energy that is produced while you brake to feed the battery. As you drive, normal braking increases the available charge to the battery and saves on fuel economy. Bonus: you’ll be able to drive past more gas stations than you’d imagine. Compared to standard cars, hybrid and electric vehicles have smaller engines—since the engine is not the only source of power. These motors are also more efficient. The bodies themselves are usually built with more lightweight materials. This stands to reason; after all, the heavier the vehicle, the more gas you’ll need, as more torque is required to move the wheels. Regardless of the type of hybrid or electric vehicle you choose, the vehicle will naturally emit less pollution than a vehicle that runs on gas alone. No surprise—governments love this. That means in Ontario, you can claim a tax credit on the Bolt, Volt and Cadillac CT-6 Plug-in. Do hybrids and electrics really save you money? When hybrids first hit the market, they were expensive. (Some might say prohibitively so.) That meant any savings you saw at the gas station were eaten up in the initial cost of the vehicle. However, hybrids have since become more popular and more manufacturers are making them. And with demand higher, prices have come down. You can now get into a hybrid for under $40k. No, that’s not laundromat money. But when you think about the fact that you’re driving the most advanced tech on the road and saving the environment at the same time, it’s a remarkable price. 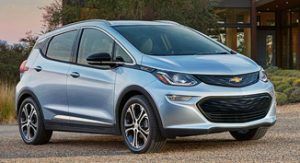 As we mentioned above, the Chevy Bolt EV is an electric vehicle, and the Volt is a hybrid—what Chev calls an extended-range electric car. Both will save you money over time and both contribute much less (and, in the case of the Bolt, nothing) to greenhouse gases. One of Car and Driver’s “10Best”for the 2017 model year. Cadillac is in on the action with the CT6 Plug-in. When it relies exclusively on the battery, this hybrid will go 50km—pretty remarkable. The gas engine is a high-output 2.0-litre turbocharged four-cylinder. Regenerative braking helps recharge the electric motor—plus, as the name implies, you can plug this Caddy in to recharge it. A full charge and a full tank of gas will get you about 700 km. Buick’s new SUV reportedly will be based on the Bolt, using the same 60kWh battery that the Bolt uses. Green Car Reports says it may end up looking a lot like the current Buick Encore. If you take longer trips and don’t have a second vehicle, the Volt or CT6 might be better for you, as they rely on electricity and gas combined. But if you want an affordable, green way to commute back and forth without having to fill up, the Bolt is the perfect solution. Drive it to work and back, plus do a few errands, and then charge it overnight and you’ll be ready to go the next day. Either way, if you’ve been considering a hybrid but haven’t been able to make up your mind, stop in to Budds’ and talk to us. We’d love to, ahem, plug you in.